The first hotel to enter China from The EDITION brand, The Sanya EDITION Hotel has been praised by guests for its simple and stylish design style and exciting multi-functional activities. 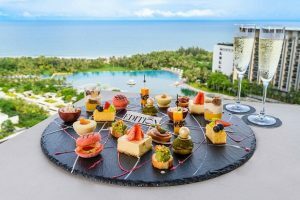 Inspired by The EDITION brand’s original four locations London, New York, Miami and Sanya, The Sanya EDITION has created “Skybar Afternoon Tea”, bringing together classic afternoon tea dishes from around the world, to be enjoyed overlooking the stunning views from the hotel’s famous sky bar. The London, New York and Miami EDITION hotels have won the favour of guests from all over the world for their unique designs and cuisine. EDITION hotels have become a gathering place for fashion industry types and food lovers, leading local cultural trends. 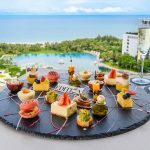 With this new Sky Bar Afternoon Tea, the creative dining team at The Sanya EDITION has drawn inspiration from the four existing EDITION properties to create a truly unique and international dining experience. From London, diners can expect to indulge with a simple yet delicious Avocado Toast with Lemon Short Cake; from New York, inspiration has been taken from the quintessential New York cheesecake made with American lemons, paired with a Beetroot and home cured salmon muffin; from Miami, expect beach vibes with Coconut, pineapple and white chocolat “Pinya colada” with a Passion fruit and crab salad; and finally, from Sanya, The Sanya EDITION has put its own unique spin on local delicacies with offerings such as Green tea puff, Banana and nuts trifle, Tuna and mango tataki and Iberico & fig bruschetta. Sky Bar Afternoon Tea includes all of the above and two glasses of sparkling wine for RMB 388. Book a table over the phone +86-0898 8858 or online www.editionhotels.com/sanya/.